Four years later the trustees of the Hall and Asylum Fund purchased for $340,000 the land on the northeast corner of 6th Avenue and 23rd street, directly across from the magnificent Booth’sTheatre which had opened earlier that year. The trustees called upon Philadelphia Lodge member, architect Napoleon Le Brun who had relocated to New York about 1861, to design the new structure. Perhaps Le Brun was inspired by the grand granite Shakespearean theater across 23rd Street. But whether he was or not, his design would create a pair of architectural bookends in the same French Second Empire style. The Financial Panic of 1873 would delay construction, causing the project to plod slowly along for five years. But finally on June 2, 1875 the building was completed at the staggering cost of $1.279 million. The five-story granite structure was, indeed, grand. Two bronze pillars, 14 feet tall and weighing 3,000 pounds each, supported the 23rd Street portico. Each of the Egyptian-style pillars cost about $10,000. The floors above the rusticated base were highly delineated by brawny stone courses. The Parisian-like mansard featured dormers and ornate oculi, culminating in a bulbous cap crowned with elaborate cast iron cresting 165 feet above the street. The ironwork imitated wickerwork, decorated with lotus flowers and buds. The new Masonic Temple sat at the terminus of the Ladies’ Mile shopping district—an opportunity not overlooked by the trustees. The street level was designed to accommodate several shops along 23rd Street and 6th Avenue. Income for the erection and maintenance of an asylum would also come from the renting of certain semi-public rooms. The Grand Lodge room, 85 by 92 feet and 28 feet tall, could be rented for lectures and church services, for instance. The room could accommodate 1,000 persons. Two bronze sphinxes, symbolizing Mystery, guarded the grand stairway leading to the main corridor of the second floor. The seven interior Lodge rooms were design in differing historic and architectural styles. There was a Tuscan Room, the Roman Doric Room, the Ionic Room, the Livingston Room, and Composite Room, the Corinithian Room and the Clinton Room. There was an Egyptian Room devoted solely to Chapters of Royal Arch Masonry—62 by 30 feet; similar in size to the others. This room represented “the interior court-yard of a temple at the time of the Ptolemies, surrounded with massive columns with the lotos capital, and bearing a scrolled and reeded entablature,” said the New York Tribune. The entire fifth floor, within the mansard pavilion, was occupied by the Knights Templars and members of the A. and A. Rite. Here the main hallway led to an octagonal room 20 feet in diameter, with a vaulted, tent-like ceiling. Each of the eight walls contained a door to various rooms. One of the most striking rooms was the asylum. “A Standard History of Freemasonry in the State of New York” said “The asylum is 78 by 41 feet, and 21 feet high, and is designed after the French Gothic style of the fourteenth century.” The Council Chamber was designed “of Saracenic architecture,” the Banquet Hall was Early Normal and there was an armory “containing hundreds of closets to contain the Knights’ equipments.” The medieval-inspired surroundings contrasted with up-to-the-minute conveniences like the two elevators. When the big day came, tens of thousands of New Yorkers crowded the main thoroughfares to witness the grand procession which The Freemason’s Chronicle said outdid the recent installation of the Prince of Wales as the Most Worshipful Grand Master of England. “In New York a grand procession of over 25,000 of the Craft marched in serried ranks through some of the leading thoroughfares of the city.” Each of the 26 divisions, seven of which were Templars, marched with its own band and in some cases more than one. Platoons of mounted police brought up the rear. Although the Central Safe Deposit Company took the main store space on 23rd Street, rental income fell far short of what the lodge anticipated. In 1870 the Masonic Record said “It is estimated that the yearly receipt from the whole building will be between $75,000 and $1000.” It did not happen. The effects of the Financial Panic were still evident. 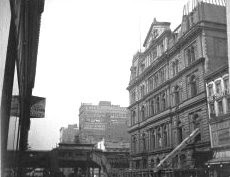 Peter Ross wrote “The financial stringency of the time was severely felt, creditors were clamorous, payments were slow and the building did not begin to yield anything like the rental revenue which had been anticipated. For a time it seemed as though the craft had become possessed of a white elephant.” Slowly, however, things turned around. The upper rooms became popular for large funerals and similar gatherings and the shops were eventually leased. Among the many high profile funerals held here, one would stand out. Baron Ludwig Von Palme, a former officer in the Royal Bavarian Cavalry, was in his own words “long a student of the occult.” He became involved in the Alexandra Society which, among other things, advocated cremation. The group felt that burial was unhealthy for the populace due to poisonous gasses given off by buried corpses in overcrowded graveyards. There was also the still-fresh memory of Civil War soldiers who had been hurriedly and mistakenly buried alive. When the Baron died in 1876, The Theosophical Society announced his solemn “Rite of Transition” would take place at the Masonic Hall. When the press informed readers that the Baron’s body would be cremated—the first cremation ceremony ever held in the United States—it created a frenzy of public animosity. Among the well-known mourners who arrived that morning was Thomas Edison in a frock coat and striped trousers, and General Doubleday in full dress uniform. But the respectful attitude soon changed as a throng of over 2,000 curious and angry people also crushed into the hall. Conservative Christians waved signs calling the cremation blasphemous. Colonel Ben Colcott began the eulogy. He uttered a few words before the crowd ignited. “Our friend, this nobel cavalryman, resides now with the Great Astral Light to await his next Posting upon the Earthly Plane—“ Shouts of “That’s a lie!” and “That’s paganism!” interrupted the Colonel and the crowd pushed forward. 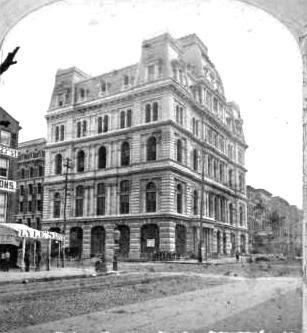 The grand building was nearly lost on December 1, 1883. After Mrs. Knight a “scrubwoman,” noticed smoke seeping through a wall on the top floor janitor Joseph W. Kelsey and his assistant, William McEnroe found a fire. With help from elevator attendant Cornelius Torrey they attempted to quell it with buckets of water. As the flames worsened, they tried the fire hose in the main hall, but it was too short to reach the fire. By the time the fire department arrived, the entire commandery room was engulfed. Firemen lugged heavy hoses up the five floors. Because of the eccentric layout of the rooms the firefighters were heavily taxed in reaching the flames with their hoses. “At one time it was feared that the entire top floor and the roof of the structure would be destroyed,” reported The New York Times. The three-alarm fire was finally extinguished, but not before devastating damage was done. The Asylum was gutted. “The hanging ceiling was frescoed in blue, ornamented with golden stars. A heavy Wilton carpet covered the floor. The gas-fixtures were unique and expensive, and the hangings and draperies were costly. Twelve thousand dollars were expended in fitting up this room, and everything in the room is ruined.” Rooms that were not damaged by the flames were seriously water-damaged. The loss was estimated at approximately $185,000. Following the fire, the magnificent mansard dome was gone. The building was quickly restored and popular public events were soon taking place again. In November 1885 a “Crazy Work” exhibition highlighted a dizzying display of crazy quilt work. “An hour in the Masonic Hall will give any one a fair idea of what women’s work may come to when it becomes merely women’s leisure employment,” said The Times. The feature of the show was Emma F. Wright’s quilt. She had sent a quilt piece to persons of note around the world, politely asking them to sign the cloth. Her finished quilt included autographs by Queen Victoria, the Prince of Wales, James Russell Lowell, W. E. Gladstone, President Cleveland, General Grant, former President Arthur, Edwin Booth, and Susan B. Anthony. Religious services were also a mainstay in the rented rooms. Here on April 29, 1894 1,000 people heard the sermon of Mgr. Bouland, a converted Roman Catholic who was now prelate of the French Protestant College in Springfield, Massachusetts. His inflammatory discourse was intended to instruct his flock in the evils of Catholicism—what he called Romanism. “What does Romanism teach? It teaches injurious errors and superstitions at which our reason revolts and which are destruction to all private and public morals and fatal to the progress of nations. By the turn of the century the once-stylish Second Empire style of architecture was, at best, passé. In 1904 The American Tyler-Keystone, a Masonic periodical, disparaged the New York temple. “The old hulk at Sixth avenue and Twenty-third street is utterly inadequate. Napoleon Le Brun, the French Architect (born in Philadelphia)—or to give him his full name, Napoleon Eugene Charles Henry Le Brun—commited a good many notable crimes in ‘frozen music,’ but the Masonic Temple was about his worst offense.” The magazine called it a “scarecrow structure” and an “abomination.” “Le Brun has been dead four years so he is not here to answer for his sin,” it said. By May 1911 Napoleon Le Brun’s “monument to his genius which will never die” was gone. The new, 1911 Masonic Temple and office building still survives. Great write-up! Freemasonry is a very interesting and intriguing subject! I actually visited the Masonic offices there once back in the 1980's to find a record of my Grandfather's initiation and elevations in the Masonic Order in a lodge in Berford-Stuyvesant in Brooklyn. All old archives from lodges from all across the City are evidently stored in that facility. I was initiated almost 40 years ago in the new Masonic building, Doric Room on Oct 20 1973. I was very happy to find this article. Just tonight I found a very small obituary of my great-great uncle, Robert Wood, who died at the age of 36. 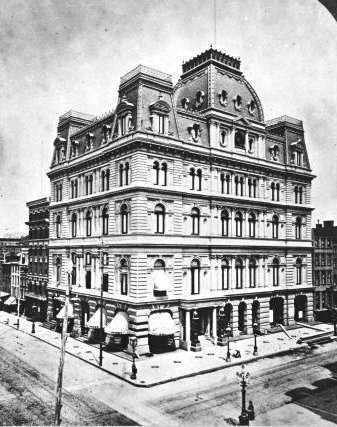 Funeral services were held at the Grand Lodge Rooms, Masonic Hall, 6th Ave and 23rd St.